Modernist Bread: The Art and Science is a revolutionary new understanding of one of the most important staples of the human diet. Created by the team that published the award-winning Modernist Cuisine: The Art and Science of Cooking, this massive treasury of practical knowledge and groundbreaking techniques captures over four years of independent research and collaborations with leading industry professionals; the result is the most in-depth look at bread to date. Stunning photography brings the complete story of bread to life across more than 2,300 pages-uncover its incredible history, loaves from every corner of the world, and the breath-taking beauty of scientific phenomena at work above and below the crust. In addition, you will discover innovative recipes and techniques developed by the Modernist Cuisine team that have not been published anywhere else. 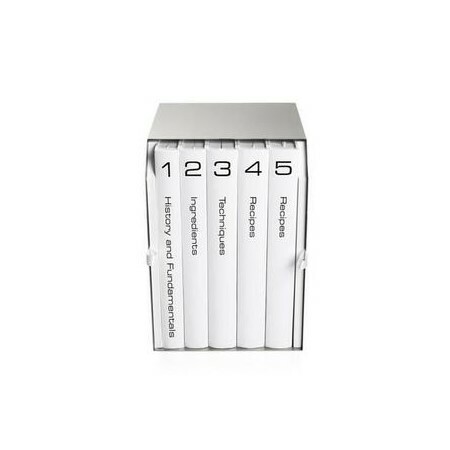 Housed in a sleek stainless steel case, this five-volume set contains more than 1,500 traditional and avant-garde recipes, as well as a wire-bound kitchen manual so that you can easily bring all of the recipes into the kitchen in one compact collection. Modernist Bread is sure to become an invaluable resource for anyone who has a thirst for knowledge about bread or wants to advance their craft. This book is a call to arms for any baker-whether you are a strict traditionalist, avid modernist, home baker, restaurant chef, or an artisanal baker-to embrace the possibilities of invention and follow your inspiration to make breads in your own way. Modernist Cuisine team is an interdisciplinary group in Bellevue, Washington, founded by Nathan Myhrvold. The team comprises scientists, research and development chefs, a full editorial and photography department, and business and marketing staff-all dedicated to advancing the science of the culinary arts through creativity and experimentation. Nathan Myhrvold is founder of The Cooking Lab and lead author of Modernist Cuisine: The Art and Science of Cooking, Modernist Cuisine at Home, The Photography of Modernist Cuisine, and the forthcoming book Modernist Bread: The Art and Science. He routinely pushes the boundaries of culinary science as a chef, scientist, photographer, and writer. He has had a passion for food and photography since he was a boy. At a young age he consumed cooking books and invested in new cameras and lenses-even while doing postdoctoral cosmology work with Stephen Hawking. While working as the chief technology officer of Microsoft, he took a leave of absence to earn his culinary diploma from École de Cuisine La Varenne in France. Nathan retired from Microsoft in 1999 to found Intellectual Ventures and pursue several interests, including his lifelong interest in photography, cooking, and food science. Inspired by the void in literature about culinary science and the cutting-edge techniques used in the world's best restaurants, Myhrvold assembled the Modernist Cuisine team to share the art and science of cooking with others. Francisco Migoya leads the Modernist Cuisine culinary team as head chef. Together with Nathan Myhrvold, he directs culinary research and the development of new techniques and recipes for the team's next book Modernist Bread: The Art and Science, on-sale Spring 2017. An innovative pastry chef, his most recent book, The Elements of Dessert (John Wiley & Sons, 2012), won a 2014 International Association of Culinary Professional Cookbook Award in the Professional Kitchens category. He has been recognized as a top U.S. pastry chef and chocolatier, with accolades that include the Medal of Master Artisan Pastry Chef (2013) from Gremi de Pastisseria de Barcelona. Migoya owned Hudson Chocolates in New York and worked at both The French Laundry and Bouchon Bakery as executive pastry chef. Prior to joining the Modernist Cuisine team, Migoya was a professor at The Culinary Institute of America, where his areas of instruction included bread, viennoiserie, pastry, and culinary science.